Out now: the Frenzy Party Dress!! The Liaison pumps come with optional ankle-straps and ankle-warmer-socks that can each be toggled on or off. So you can choose to wear them as classic pointy pumps, or as pumps with ankle-straps, or you can style them in season by adding the knit ankle warmer socks. The pumps are also scripted with 4 sole colour options. 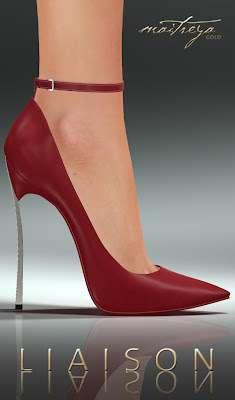 These mesh pumps come in the standard sizes, both in rigged and in un-rigged (resizeable) versions.